These compact strip-cut shredders are as small as a wastebasket and designed for use alongside the desk or workstation. 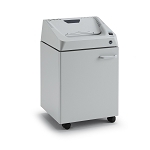 Our deskside strip-cut paper shredders are generally less than two feet tall and provide on-the-spot destruction of sensitive paperwork, telephone notes, and phone messages generated during the day. Every option of compact strip-cut shredder in this collection is ideal for use by busy professionals and secretaries or for the small home office. Every model of deskside strip-cut paper shredders meets the new HIPPA requirements and are available on GSA Schedule. No matter what your operation requires, you can find the premium-quality machine you need right here at Capital Shredder.